Penn student's film wins Oscar. Tamala Edwards reports during Action News Mornings on February 25, 2019. PHILADELPHIA (WPVI) -- A University of Pennsylvania sophomore is celebrating a big win at the Oscars. "Period. End of Sentence." won an Academy Award for Documentary Short Subject. Twenty-year-old Claire Sliney is a co-executive producer on the film. When her film was nominated, Sliney told Penn Today, "It is incredible. I never thought we would have made it to this point at all. Or even made it to India with a completed film, let alone an Oscar nomination. Every single expectation I had for this project has been surpassed." 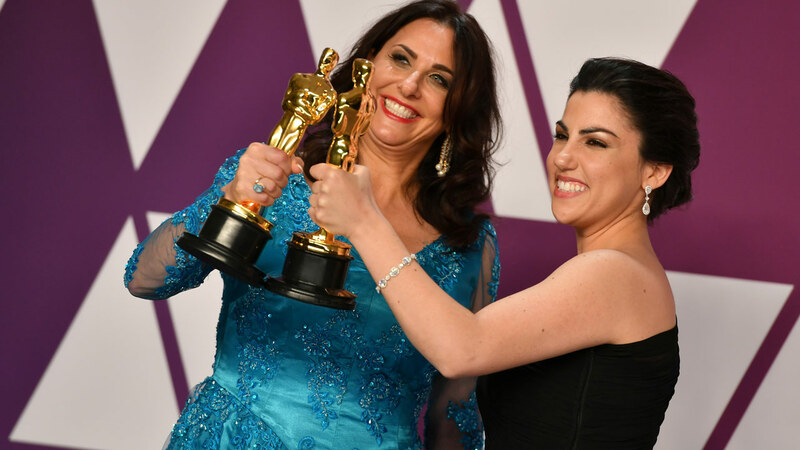 Co-directors Melissa Berton and Rayka Zehtabch accepted the Oscar Sunday night. Melissa Berton, left, and Rayka Zehtabchi pose with the award for best documentary short subject for "Period. End of Sentence." in the press room at the Oscars on Feb. 24, 2019. Sliney, a Los Angeles native, has been involved in the project since her freshman year in high school. Berton, a producer of the film and an English teacher at North Hollywood's Oakwood High School, was all smiles as she accepted her Oscar on the Academy Awards stage. Sliney is a philosophy, politics, and economics major in the College of Arts and Sciences at Penn.